I've mentioned the Knit It! magazine that Jason bought me at the end of December. 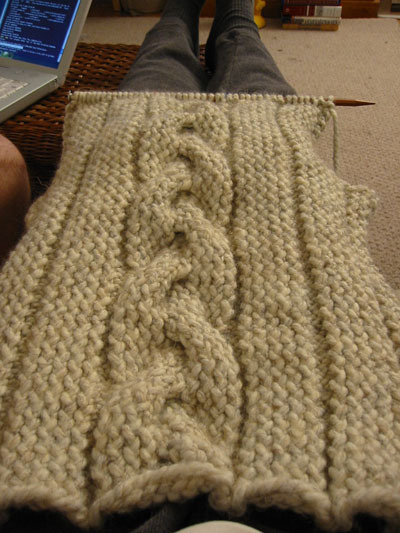 I decided that I would use one of the patterns in it to make my first "real" knitting project -- a cabled sweater! Since I'm not sure how it's going to turn out, I decided that it would only be fair to make it for myself. I wouldn't want to subject anybody to my first ever knitted garmet, right? This makes me a good friend, right? It's a simple pattern (called Woman's Quick Cable Sweater, number 26 in the magazine), and it's knitted with Lion Brand's Wool-Ease in Wheat using #11 needles. The picture is of the back, which I finished this weekend. I'm about 30 rows into the front. Whee! Shannon, that's a great pattern! I do have a question, though. Do you knit holding the yarn in your left hand or your right? The reason I ask is that in looking at your sweater, it appears that all your knit stitches are twisted. I've seen this phenomenon a lot in knitting classes I've taught. Even my mother-in-law knits this way. It'll make a huge difference in your knitting if you don't twist the stitches.